Recently, we’ve been talking a lot about the “product team” model which has been so successful for delivering technology at IAVA and a couple of other leading organizations. The crux of this model is that you create a product team inside your organization, charged with stewarding your investments in technology. Adding a product team is a really simple concept, but in practice it ends up being a fundamental shift in how an organization approaches technology. Why is this shift necessary? Because these days, there’s a new rung on the ladder of work that didn’t really exist 10 years ago. Digital tools used to be products like Excel or Photoshop, and you could hire experienced practitioners to use those tools. Now, much of the software we interact with is on the platform level. Out of the box, they have some functionality, but their real power comes from how you can customize them for your particular needs. Of course, no one is forcing you to do that. If you’re using out-of-the-box tools and they’re working well for you, by all means you should continue. However it’s much more common for an organization’s technology to be a major source of frustration, or at worst a significant roadblock to its ability to deliver on its mission. We see this as a logical result of the chaotic model of technology management that has been standard practice for so many years. In contrast, empowering a dedicated team to do that job in a thoughtful, coordinated way is amazingly valuable. It’s the ultimate new force multiplier. And in the competitive landscape we have today, many organizations are experimenting with this new level of power. Perhaps you’re doing it already, or your competitors are. 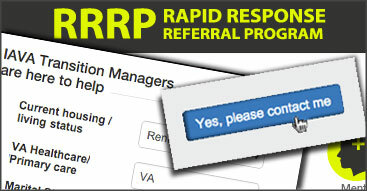 IAVA’s Rapid Response Referral Program (RRRP)—its signature case management and referral program—is a great example of how this works. That program started with someone’s idea that IAVA could do case intake and refer veteran members to useful programs and services. Initially it looked like basic case management; but over the course of time, it steadily evolved as new ideas and feedback came in from staff and members. Because the product team was there to steer that evolution, the technology was able to quickly adapt to each of those new ideas. Before long, the RRRP program was doing several things that weren’t even on the radar initially, such as gathering feedback from members about the services that were referred, giving members one-click access to open cases in the online community, publicly publishing the data about the program’s effectiveness, and several other improvements. In the end, the program has evolved quicker, has had greater impact, and has saved countless hours of staff time by automating once-heavily manual processes. These agile changes simply would not have been possible without the product team in place to understand, oversee, and implement them. It’s a huge return on the product team investment. That’s what we mean by this approach being a force multiplier. Instead of the all-too-common story of technology getting in everyone’s way, IAVA’s technology is helping make their programs stronger and their staff’s jobs more efficient. Nearly every one of IAVA’s products—and those of most tech-savvy organizations—is facing that kind of ongoing evolution, where every quarter there are significant insights that lead to new “wouldn’t-it-be-awesome-if”s. That’s the choice you’re making by having a product team. The more capacity you give your product team, the more of your “wouldn’t-it-be-awesome-if”s can come true. Of course, this model is really based on internal staffing, which can give some organizations some initial sticker shock. It’s not necessarily the technology itself that makes good tech cost so much—it’s the staffing. You have to seriously invest in people to steward your technology or it won’t be successful. And the more capacity you have— if it’s the right kind of product management capacity—the less technological pain you should have to take on. Most organizations only come to understand this after years of painful tech frustration. But ultimately it’s much more cost-effective to invest in people who can ensure your tech operation is strategic and executed well, rather than to skimp and try to get by without active management of your tech investments. For good technology you need real involvement and care. Maybe you can find ways to do things cheaper here and there. But even that takes time and care. And often, the cheaper you get it, the more you’ll have to fight to get it to where you need it in the future. You end up paying one way or the other. We’ve had some people ask what small organizations should do if they can’t afford to hire a whole product team. We think a “product” approach is more important than the specifics of the staffing. If you’re a really small organization, maybe you can get away with one person in this product manager role—or even shift someone to that role, as long as they have a clear mandate for it. But one way or another, forward-looking organizations are investing in smart product management full time. They understand that cultivating staff expertise in platform evolution as a necessary element of a modern, effective organization. The more thoughtful your internal approach to technology, the more powerful your organization can be. Pretty quickly, you end up saving yourself a world of work, improving your efficiency, and amplifying your effectiveness. Yes, you’re taking on an extra level of complexity. But that complexity is already part of the new world we work in. This approach just stops ignoring that reality and sets you up to handle it. The sooner you adopt it, the sooner you can start getting more done with less. Hear more at Chris and Sam’s session at NTC, Finally, A Model for Delivering Technology In Nonprofits That Works! Chris Zezza served as the original Chief of Digital Products for Iraq and Afghanistan Veterans of America (IAVA) as well as its Salesforce Architect. He has an extensive background in technology and nonprofits.